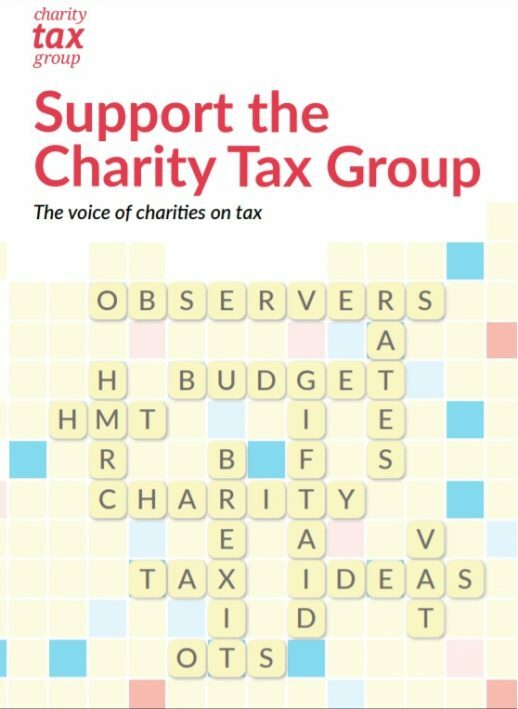 The Charity Tax Group (CTG) is the only organisation working exclusively on charity tax issues and plays a crucial role in representing the interest of charities to key decision makers in Government. You can read more about our wide range of work on behalf of the sector, in 2018, here. CTG operates on a limited budget, led by a volunteer Management Committee, and is reliant on contributions from charities. We hope that you will be able to make a donation towards our important work on behalf of the sector this year. If you are not currently a member of CTG you can register here to gain full access to the website and our regular newsletters. Looking ahead, Brexit continues to dominate policymaking and the implications for charities in the tax system are still uncertain. Whatever the outcome, there will be increased scrutiny of existing charity tax reliefs and exemptions, providing both opportunities and threats for charities. CTG is therefore investing time and money into a detailed research project to quantify the value of VAT reliefs to the sector. Feedback and financial support from charities is essential to enable us to progress this important research which will inform our representations to HM Treasury. Another high priority for CTG is to demonstrate the importance of existing Gift Aid and business rate reliefs, as well as making the case for administrative simplifications relating to compliance to save charities time and money. Investigating technical and practical charity tax issues that you raise and, where relevant, highlighting these issues in discussions with HMRC and HM Treasury.